Clearing H.Parmentier and V. Goloubew in 1924 with anastylosis by Henri Marchal from 1931 until 1936. 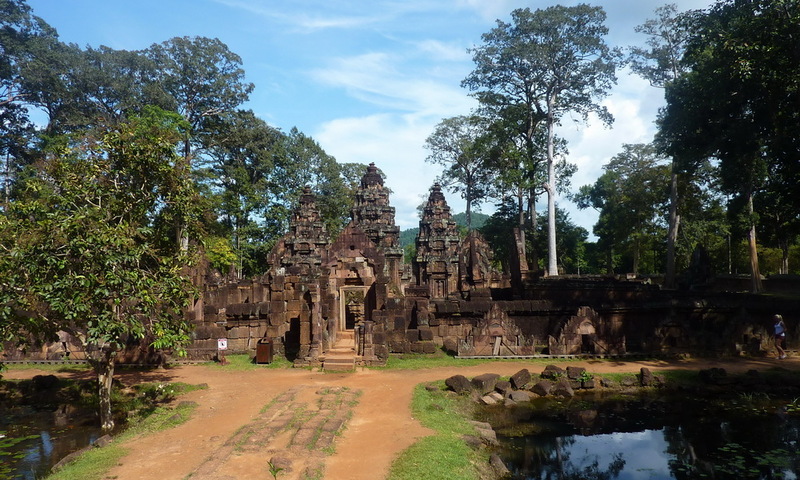 The name Banteay Srey relatively modern, means 'Citadel of the Women', or perhaps 'Citadel of Beauty', and presumably refers to its size and the delicacy of its decoration. 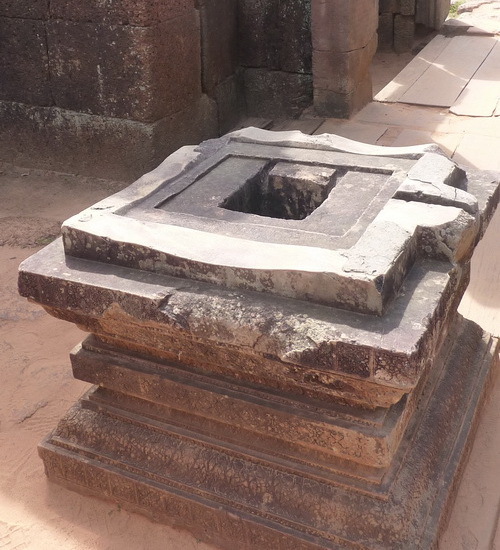 The temple's actual name, taken from that of its central linga, was Tribhuvanamahesvara — 'Great Lord of the Threefold World'. 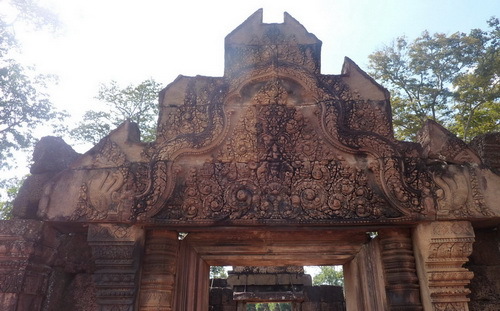 Unlike the major sites at Angkor, Banteay Srei was not a royal temple. 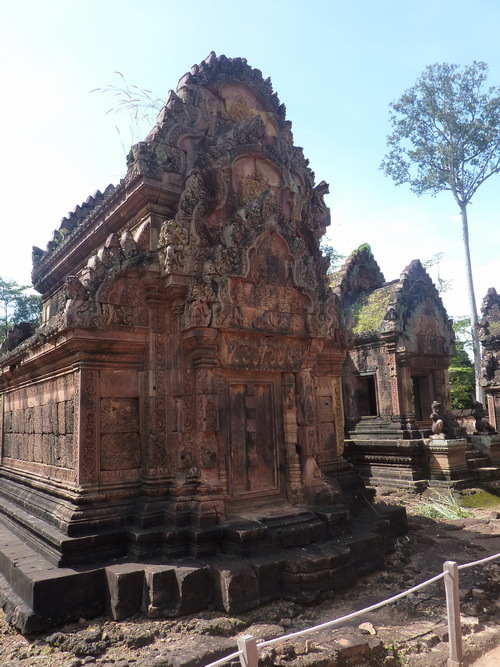 It was built by one of Rajendravarman's counsellors, Yajnavaraha, who was also the guru of the future king Jayavarman V. Yajnavaraha was granted this land on the banks of the upper Siem Reap river by the king. 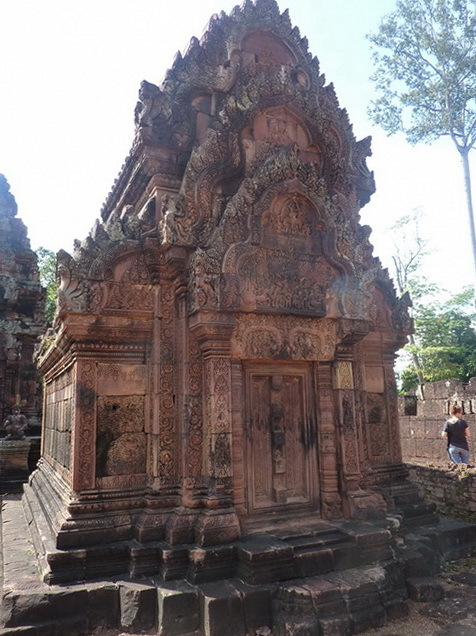 He and his younger brother commissioned the temple, which was finished just a year before King Rajendravarman died. 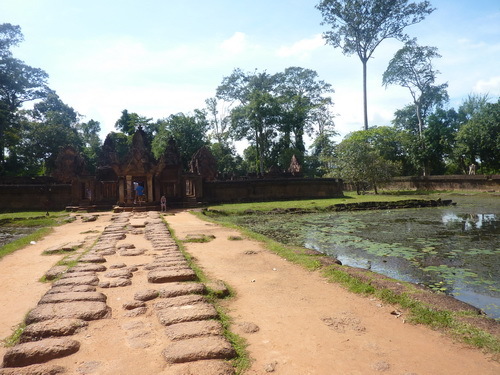 As usual, a settlement surrounded the temple; in this case, the name of the small city was Isvarapura. 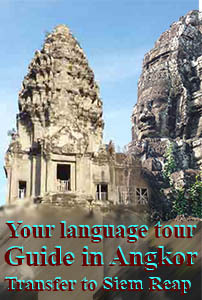 Discovered by the French only in 1914 it achieved an early notoriety when Andre Malraux, who later wrote Man's Fate and was Minister of Culture under the de Gaulle administration, thievied four apsaras in 1923. He was caught almost immediately and stolen parts was been returned by Henry Marchal with George Groslier assistance. 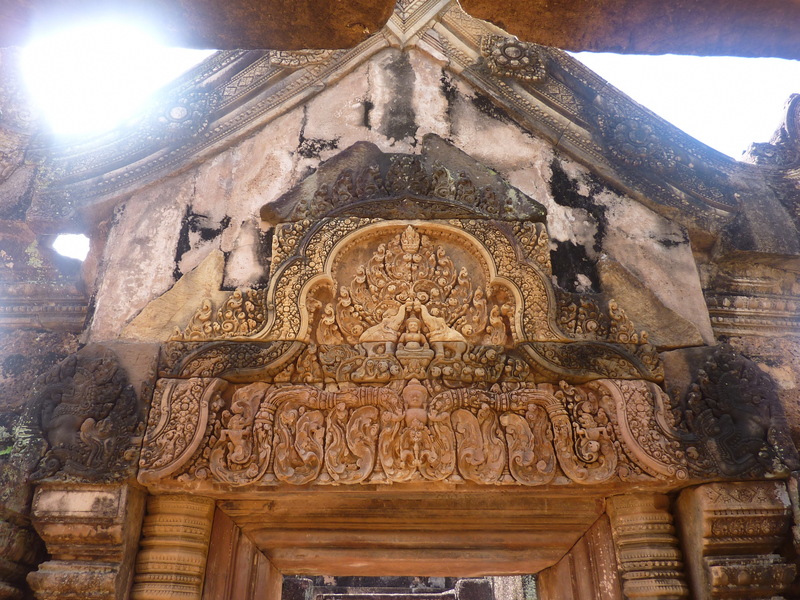 The restoration of the temple between 1931 and 1936 by Marchal was notable for the first significant use at Angkor of the technique of anastylosis, adopted from the Dutch work in the East Indies. 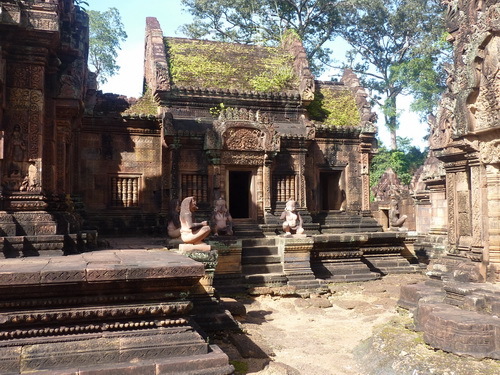 The full success of the method anastylosis undertaken Henri Marchal gave result of general acceptance of this restoration technique by EFEO, inspired by the methods used by archaeologists in Java and although the task in Banteay Srei was facilitated by the small size of the buildings, blocks of stone cut from durable sandstone, which has retained its clear thread with plenty of wonderful preserved decoration, but on the other hand, the work of Henri Marchal was complicated by the remoteness of the church are difficult to access, with minimal means and inexperienced workers who were in the process of work. 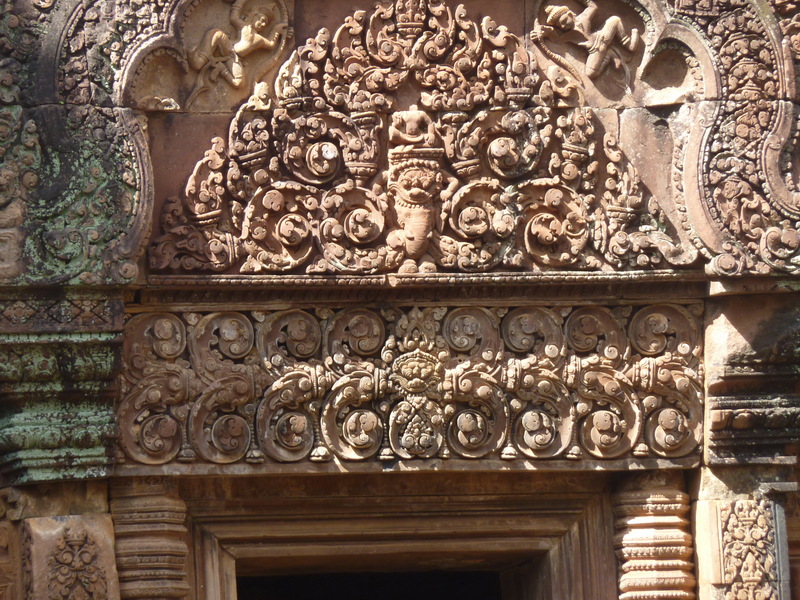 After finding of the stele of temple foundation in 1936 in eastern gopura of fourth enclosure , it became clear that Banteay Srei designed all at once, as evidenced by the uniformity of style. 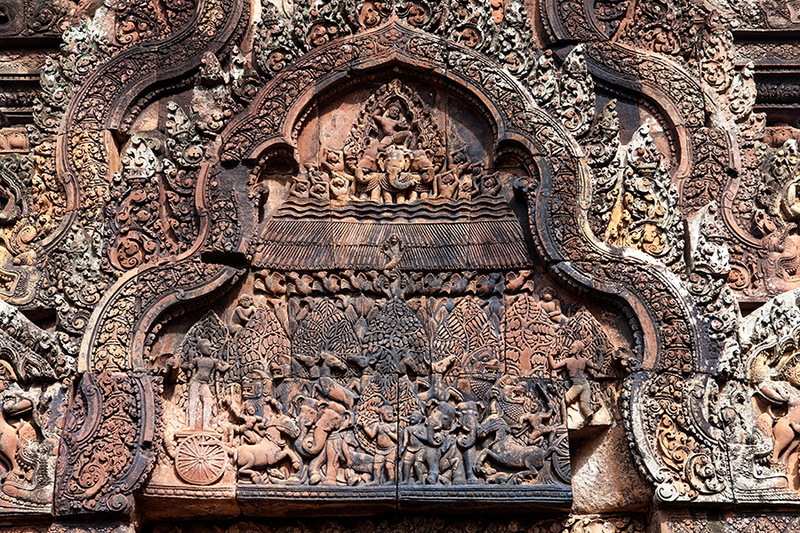 Engraved in the year 968, the first year of the reign of Jayavarman V, the inscription gives the date of April-May, 967 with the position of the sun, moon and planets. 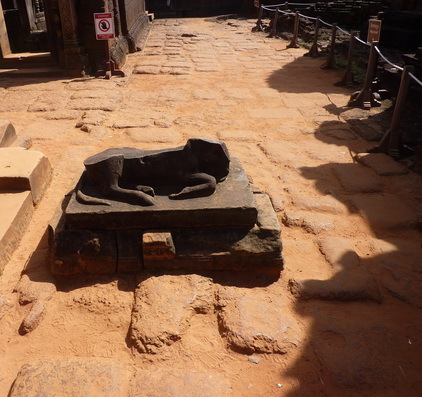 This year was the last year of Rajndravarmana, which probably started the construction of at least some part of the temple. 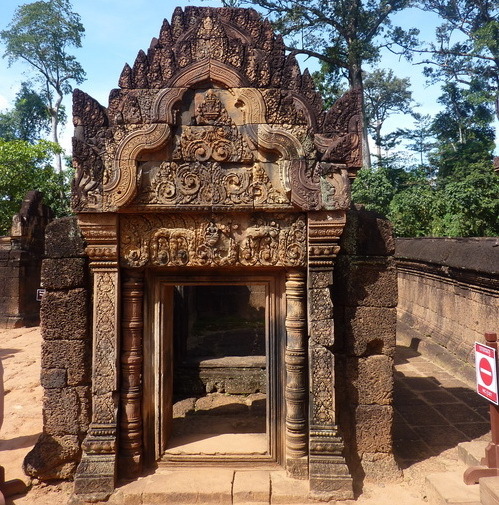 After the pray to, Shiva and his "Shakti", the text of the stela contains a eulogy Jayavarman V and his "guru", Yajnavaraha who founded Banteay Srei, together with his younger brother, instaled Shri Shiva Tribhavanamaheshvara linga in the central sanctuary. Other inscriptions engraved on the door jambs tells about other linga location in the southern sanctuary and the statue of Vishnu in the north. 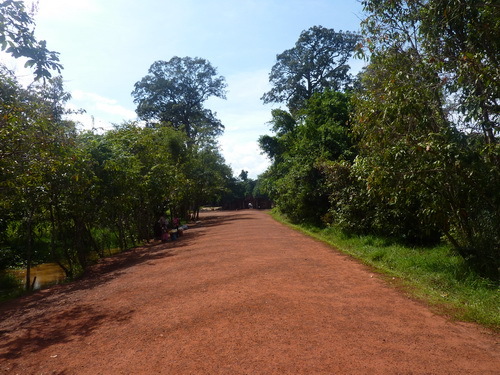 The road to one of the most beautiful temple has almost the same color as the color of the sandstone it is made. 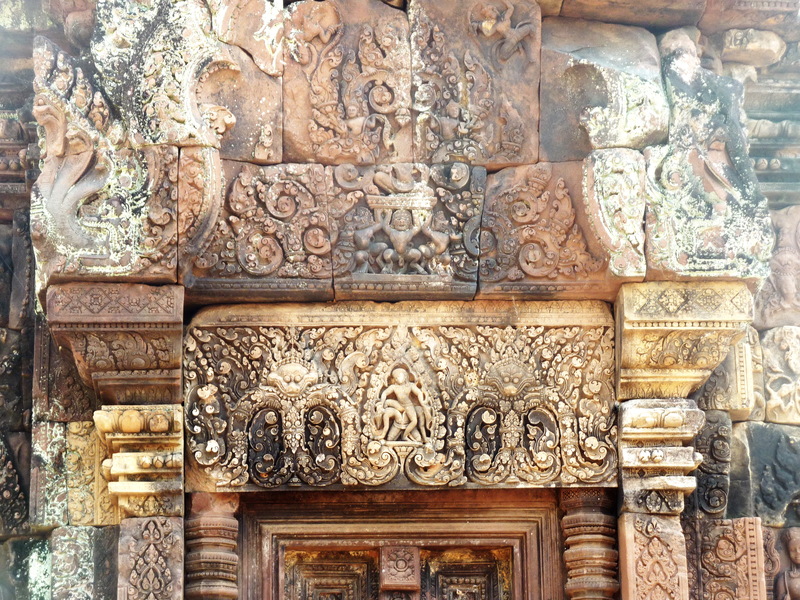 The temple begins to the east cruciform laterite gopuram with sandstone columns and finely decorated pilasters. The main stele of the temple was discovered here in 1936, enabling the date of consecration to be worked out precisely from its information about the position of the sun, moon and planets. 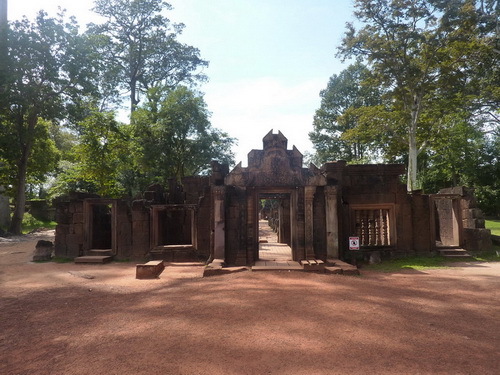 Walking through, the wide sidewalk, almost 70m distant, leads to the third enclosure and decorated with columns (32 pcs) on both side which ones collapsed by wild elephants in ancient times every year. 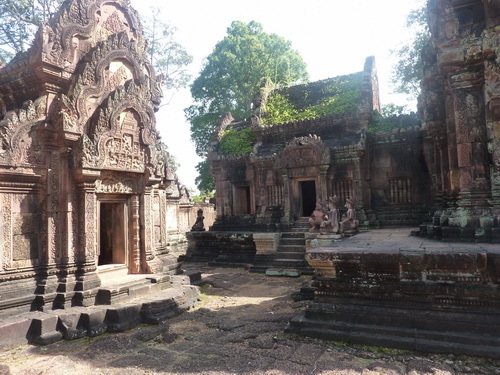 These columns are almost the same as in Preah Vihear. 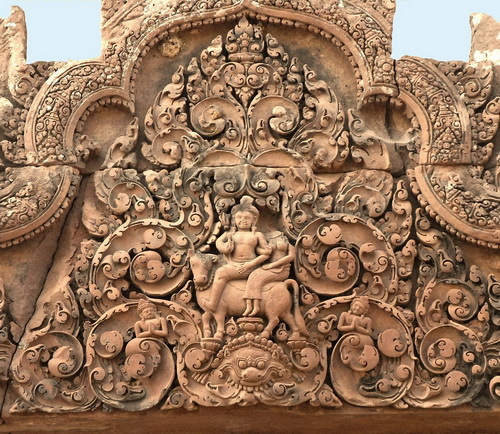 On the other right side of the causeway there is "long gallery" with a superb pediment where depicted Vishnu appeared in the avatar of a lion Narasimha at the time when the king of Asuras Hiranyahashipu going to kill his son Prahlada - a great devotee of the Supreme Personality of God. 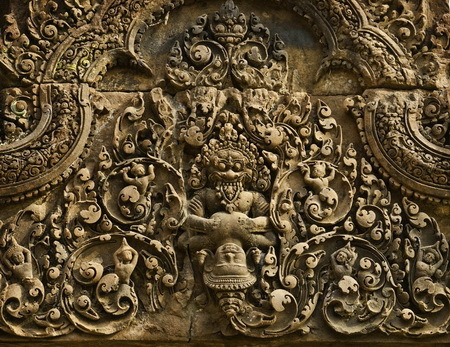 Lion Narasimha holds Hiranyahashipu and ripping the chest. Shrimad Bhagavatam 7.8. 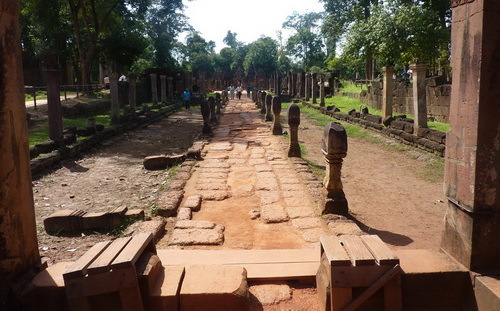 The purpose of these 'long galleries' is unknown. 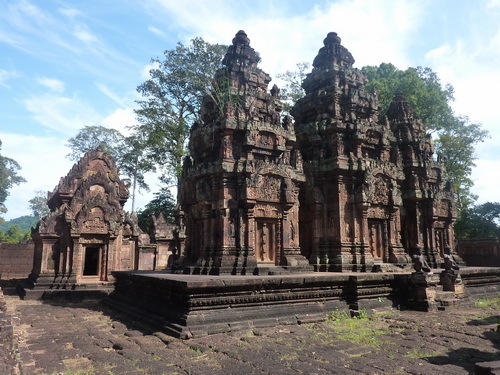 The temple consists of three enclosure which are a simple walls of 95 by 110 meters, 38 to 42 meters and 24 to 24 meters. 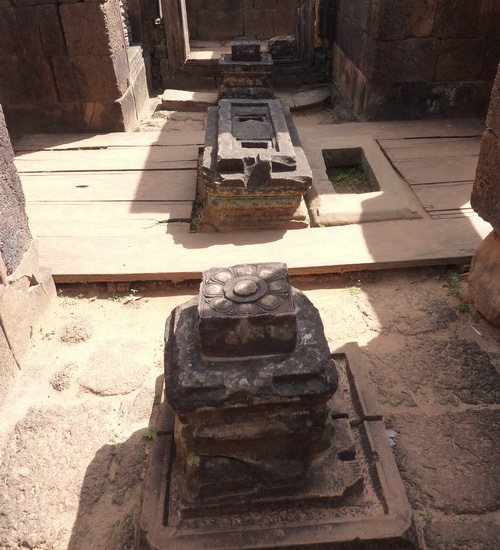 The third (outer) enclosure is surrounded by a moat with laterite boundary of the both sides, divided into east and west by the sidewalk leads to each of his gopuram. 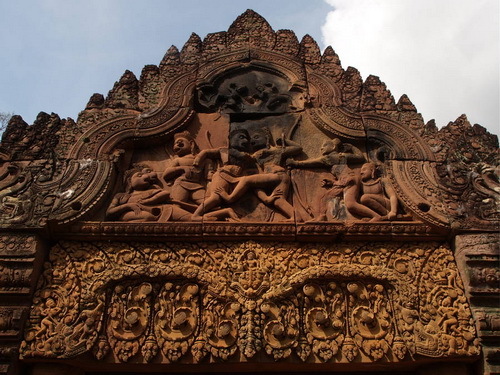 The famous bas-relief of pediment depicts no less famous story from the Ramayana as a Rakshasa (demon- eater of human flesh) Ravana, depicted many-armed and many-headed, trying to shake Kailasa Mounting where Shiva lives. The mountain itself is depicted as a tiered pyramid, like Mount Meru and is depicted in the background of a stylized forest. 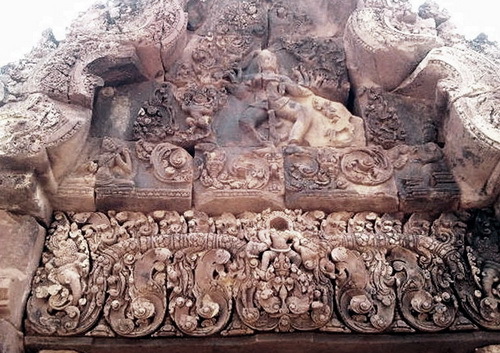 At the top sits Shiva with his wife Uma, crouching beside him in a delightful position. Shiva presses the mountain by his right foot to stop shaking. 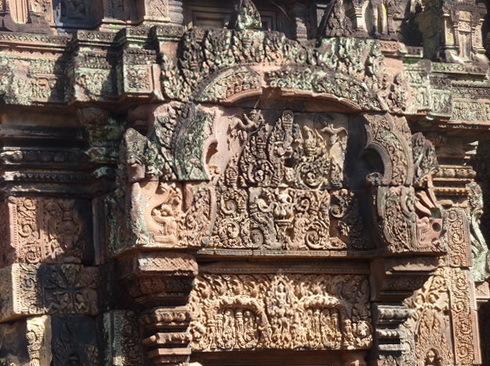 The second row shows worried priests and worshipers, showing by finger on Ravana. 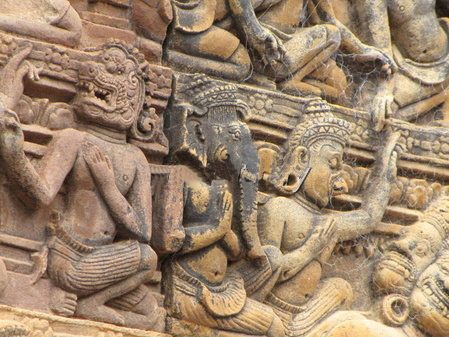 On the right is praying female figure. In the third row are worshipers with the heads of elephants, lions, birds and horses. On both sides are monkeys in fine hats. God of love (3) Kama shoots Shiva (1) to ignite the fire of the love to Parvati in his heart that they will produce children the same perfect ascetics as he is. Actually, it happened during the meditation on Mount Kailash and here he gives her a rosary. Indra and Arjuna (his son) each obliged by their promises and Dharma going to struggle that may to destroy the whole world while Krishna interfered and convinced Indra that the Pandavas are right and he must to help them to build the city named in his honor Indraprastha and fire god Agni has made for Ardjuna his great bow Gondiva from magic derived from the Khandava forest. 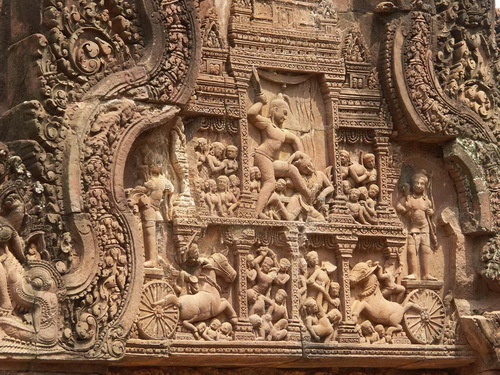 The pediment of this "library" depicts the story of the Mahabharata - A Fire in Khandava Forest. Preface: When disagreements in Hastinoapure capital between Padavas and the Kauravas became insurmountable the keeper of the throne of Khastinopour Bhishma and Minister Vedura decided to divide the kingdom of Hastinapour between the Pandavas and the Kauravas. 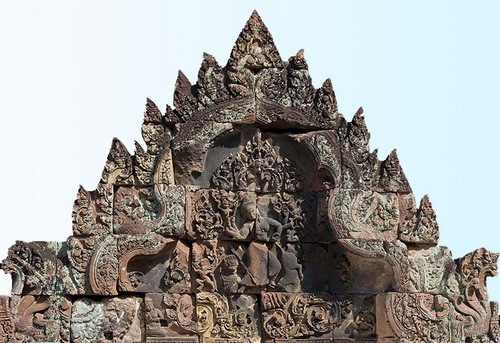 Devout Crown Prince of the Pandavas Yudhidshhera to avoid further antagonism choose for Pandavas most lifeless Khandavaprasthu province inhabited by Nagas (snakes) and Rakshasa (demons eaters of human flesh). 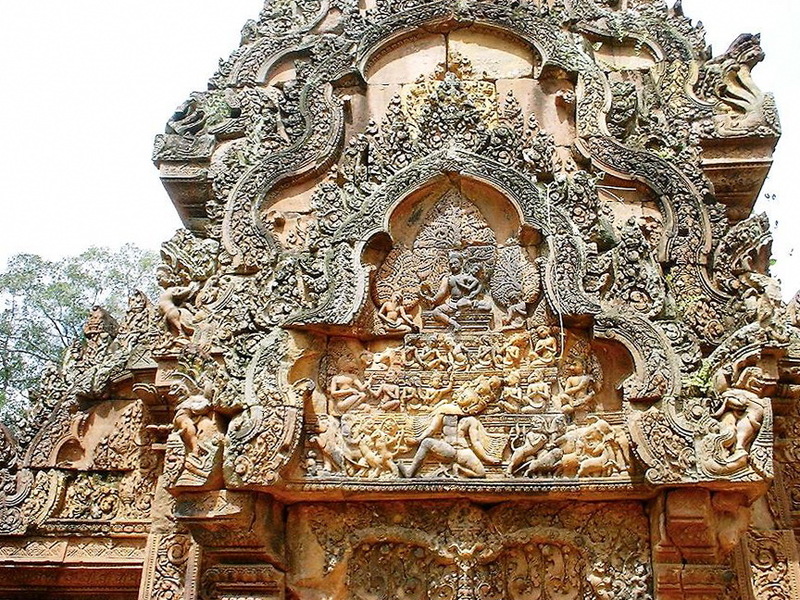 The king of Nagas Takshaka reigned in this province with the support of the god Indra who promised will not pouring a rain on that province for it may be suitable only for snakes. The Pandavas brothers: Yudhisthira, Bhima, Arjuna, Nakula and Sakhadeva offered Takshaka respect and suggest to live together that he rejected. The forest was bewitched by a Mayasura demon and Arjuna called up the fire god Agni by his arrows to cover by fire the forest just to clean it from magic without bringing a harm to trees and inhabitants (6). 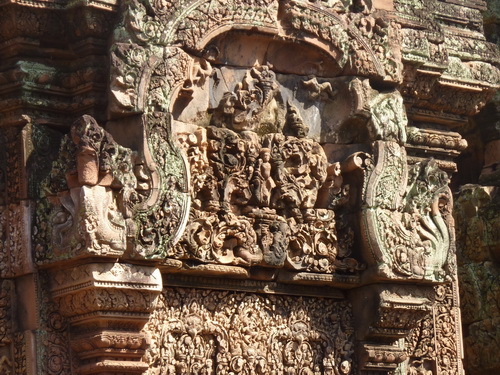 Further events is depicted in bas-relief of pediment. 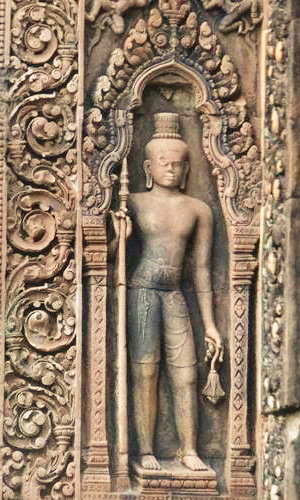 Takshaka (5) forced Indra to fulfill his promise to protect Khandava forest (8). 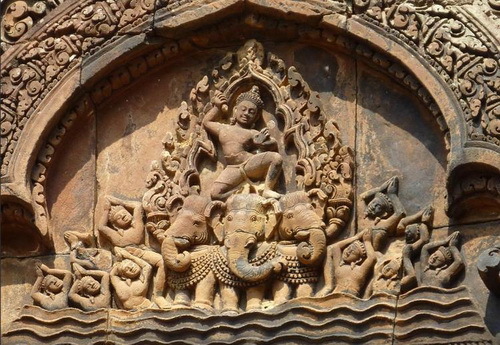 Indra on his three-headed elephant Airavata (2) unleashes torrents of rain (3) on Khandava forest(8) for extinguish the fire but Arjuna (1) obstructs the rain by his arrows (4). 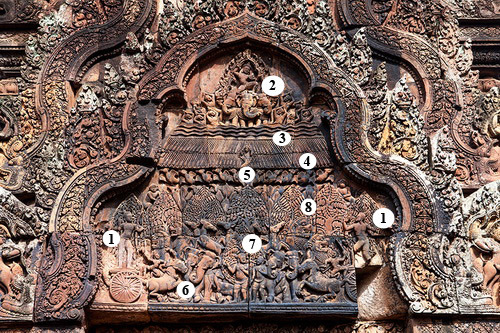 The two children's figures (7) in the middle of barelief are considered to be unknown but some time before they were considered as Krishna and Balarama in childhood. 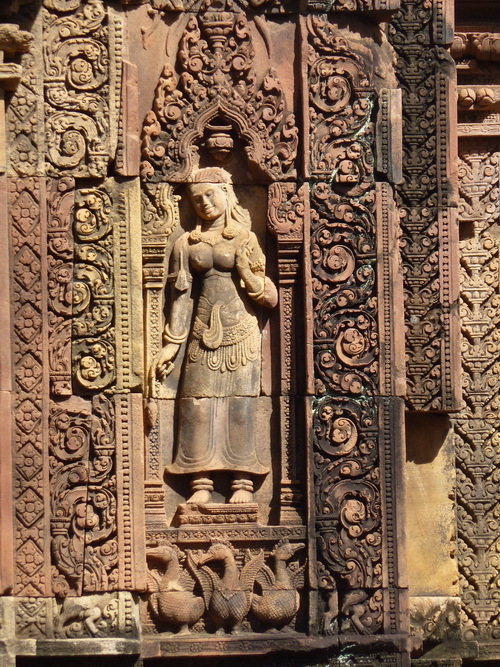 Magnificent Apsaras and guardians standing in niches on all facades. Pediment: Kubera - Got of wealth and North direction on a throne, representing the magic chariot Pushpaka, supported by three lions. 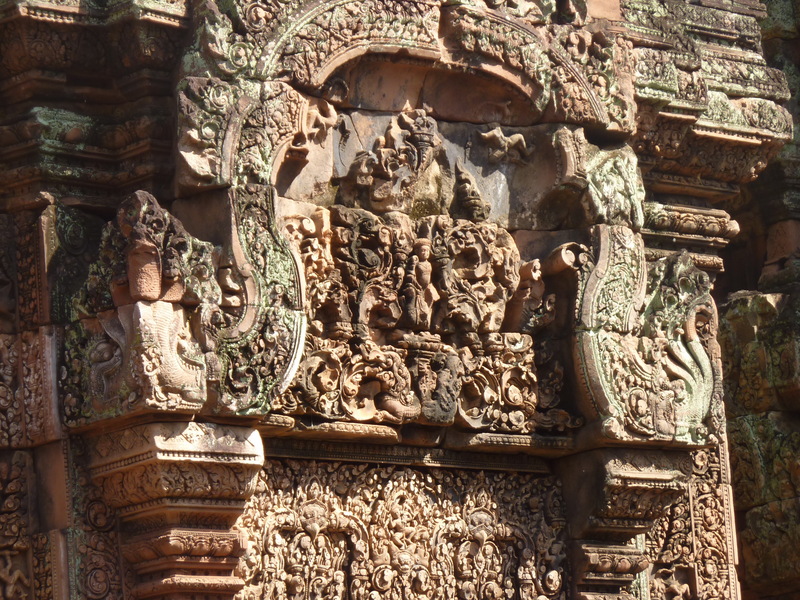 Pediment: Varuna - God of western direction and god of World Ocean on three gooses - Hamsas. Lintel: Vishnu on his vahana - Garuda. Battle between Valin and Sugriva. . 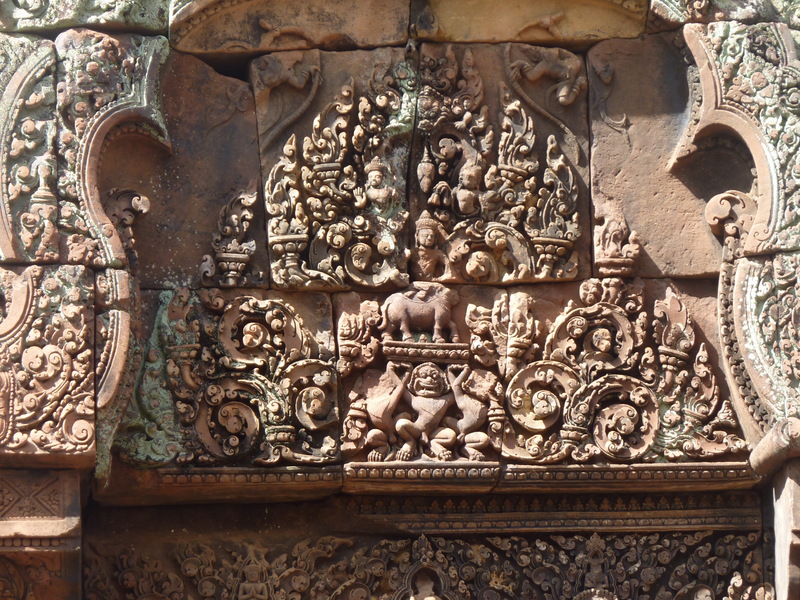 The scene from the Ramayana: Valin (the son of Indra) despoiled Sugriva's (the son of Surya - the Sun God) kingdom of monkeys. Rama promised to help him to return the kingdom in exchange for helping of monkeys kingdom army led by Hanuman against the army of Ravana to release Sita - the wife of Rama. 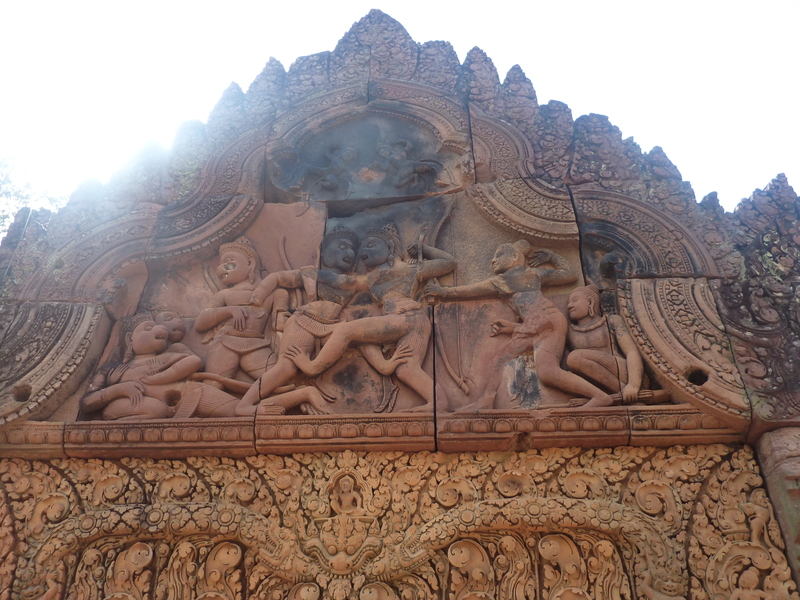 During the fight Sugriva going to defeat but Valin resorted to tricks, pretending to be dead and was ready to deal a fatal blow to Sugriva but Rama (to the right armed by bow) pierced him by arrow. Behind him, it seems, his brother Lakshman. 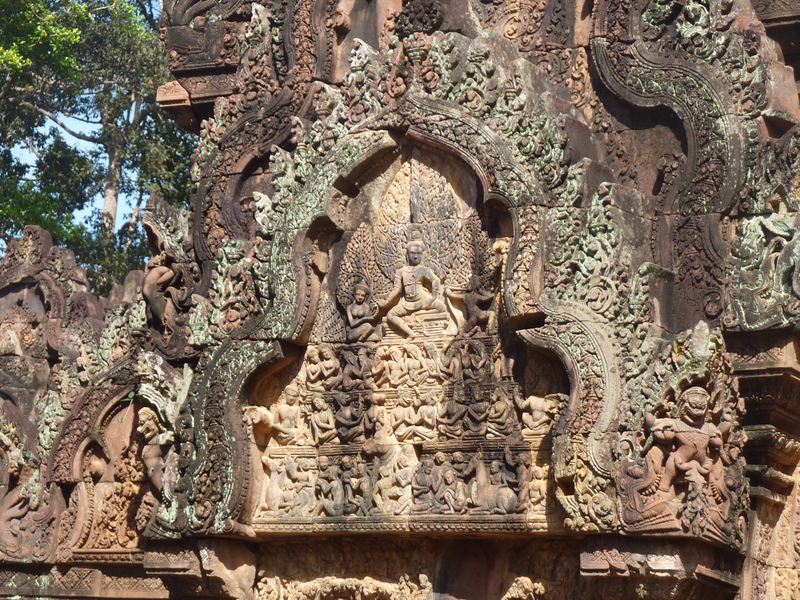 View to Banteay Srei from western gopuram.